FUSIBLE LINKS FEMALE MINI TYPE2. Buy quality Auto and Marine Electric Parts and Accessories online, Sydney. 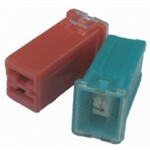 FLFMT2-20Fusible Link Female Mini Type 2 (typeII) 20 amp Light blue in colour Body is 12mm x 1..
FLFMT2-30Fusible Link Female Mini Type 2 (typeII) 30 amp Pink in colourBody is 12mm x 10.5mm x 27..
FLFMT2-40Fusible Link Female Mini Type 2 (typeII) 40 amp Green in colourBody is 12mm x 10.5mm x 2..
FLFMT2-60Fusible Link Female Mini Type 2 (typeII) 60 amp Yellow in colourBody is 12mm x 10.5mm x ..
FLFMT2-70Fusible Link Female Mini Type 2 (typeII) 70 amp Brown in colourBody is 12mm x 10.5mm x 2..
FLFMT2-80Fusible Link Female Mini Type 2 (typeII) 80 amp Black in colourBody is 12mm x 10.5mm x 2..
FLFMT2-100Fusible Link Female Mini Type 2 (typeII) 100 amp Dark Blue in colourBody is 12mm x 10.5..
FLFMT2-120Fusible Link Female Mini Type 2 (typeII) 120 amp Grey in colourBody is 12mm x 10.5mm x ..